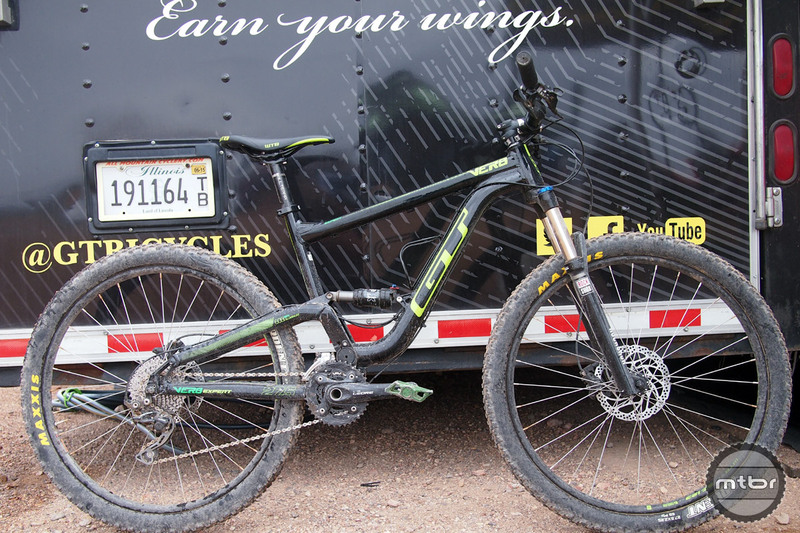 The GT Verb Expert was available for demo rides at Interbike for dealers and shop employees to experience first hand its trail worthiness (click to enlarge). Let’s face it, when buying a new mountain bike price is always a factor. This holds even more true for the beginner mountain biker who is looking to buy their first “real” mountain bike. They may be moving up from a mass market bike or a hand-me-down but they are on a very limited budget dabbling in a sport that they may or may not stick with. They want something better than what they are riding now and can handle more serious and more challenging trails. They want a bike that will allow them to grow their skills without immediate need for upgrades. 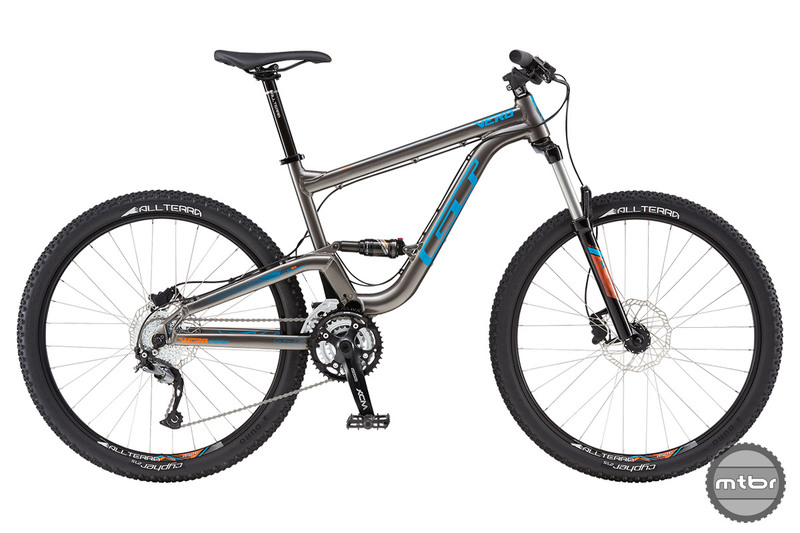 Last year, Giant came out with a line of cost conscious full suspension mountain bikes called the Stance. They offered three models with 120mm of travel and 27.5″ wheels at a very low price point. The Stance proved to be a very popular line for both beginner buyers and the bike shops selling them. In fact, I recently referred a very close beginner friend of mine to a local shop that happened to have 2015 Stances on sale. Two months in and he is completely happy with the bike and constantly asking me to show him new trails. Sure, it’s a bit on the heavy side and the rear shock doesn’t have much adjustability, but he got out of the shop for under $2000 and he has a bike that can handle more than his old 26er hardtail. 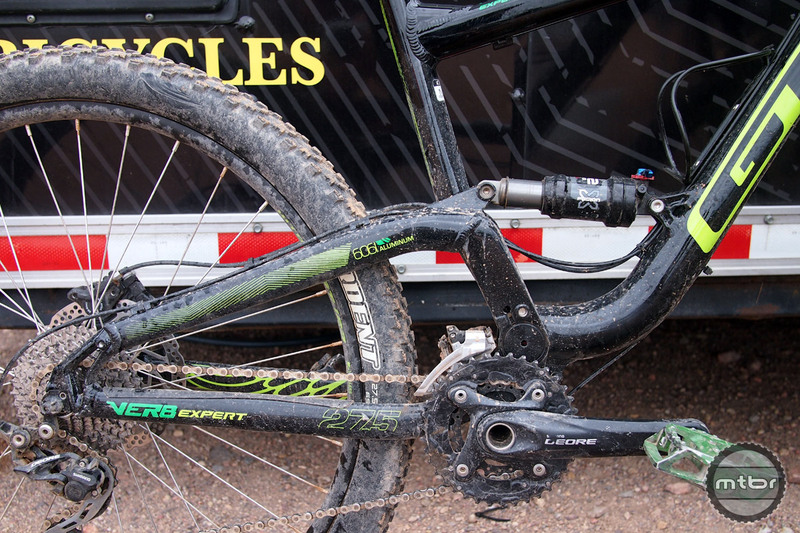 A bit dirty from demo rides, the Verb uses GT’s Independent Drivetrain system (click to enlarge). 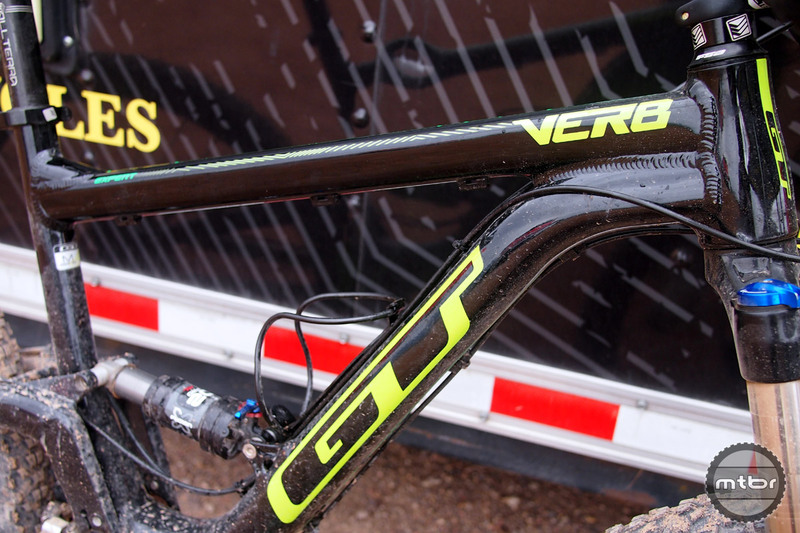 For 2016, GT has fired a clear shot at the entry level buyer’s market with a model called the Verb. The frame is 6061-T6 aluminum and uses a simplified version of GT’s Independent Drivetrain suspension design like that used on the more up market Sensor. For the Verb Expert featured above, suspension duties are handled in the rear by an X-Fusion 02 PRO RL air shock (120mm) with adjustable rebound and lockout. This is paired up front with a Rock Shox Recon Silver TK coil fork with a matching 120mm of travel and lockout. The drivetrain on the Expert is a Shimano Deore 2×10 setup, Shimano hydraulic disc brakes, WTB STP i23 rims and Maxxis Ardent 27.5×2.25″ tires. As an added bonus, all 3 models of the Verb include alloy flat pedals. Retail price for the capable Verb Expert is an amazing $1599. The Verb Elite comes equipped with an SR Suntour XCR 32 fork and Shimano Deore front and rear derailleurs (click to enlarge). The Verb Elite has a SR Suntour XCR 32 27.5 RL DS fork, All terra AO-43 AR rear shock, Shimano Alivio/Deore 2×9 drivetrain, Shimano hydraulic disc brakes, Alex rims and All Terra Cypher 27.5×2.10″ tires. The Elite has a retail price of only $1299. To reach the $1000 price point, GT used some house branded parts to get there (click to enlarge). The Verb Comp has a house brand (All Terra) fork and shock, Shimano Alivio/Deore mix of derailleurs and shifters with a Sunrace cassette, ProMax Solve hydraulic disc brakes, Alex rims and All Terra Cypher 27.5×2.10″ tires. The Comp has an amazing retail price of just $1000.00. GT deserves much credit for providing a full suspension mountain bike with legit parts for under $1600. We might be a bit hard pressed to recommend the $1000 model with the house branded fork and shock, but at least the option is there. Even though bikes at this price point may be heavier and lack a lot of suspension adjustability (like the enthusiast rider is use to), you are getting a capable bike with hydraulic disc brakes and pedals for less than $1600.00. The Verb will allows its rider to learn and grow until they up their skills (and their bank account) for a more premium ride. Until then, the Verb rider will continue to have fun on the trails and after all, isn’t that what it’s all about? For more information visit www.gtbicycles.com. This article is part of Mtbr’s coverage of the 2015 Interbike trade show in Las Vegas. For more from Interbike CLICK HERE. To reach the $1000 price point, GT used some house branded parts to get there. The Verb Elite comes equipped with an SR Suntour XCR 32 fork and Shimano Deore front and rear derailleurs. 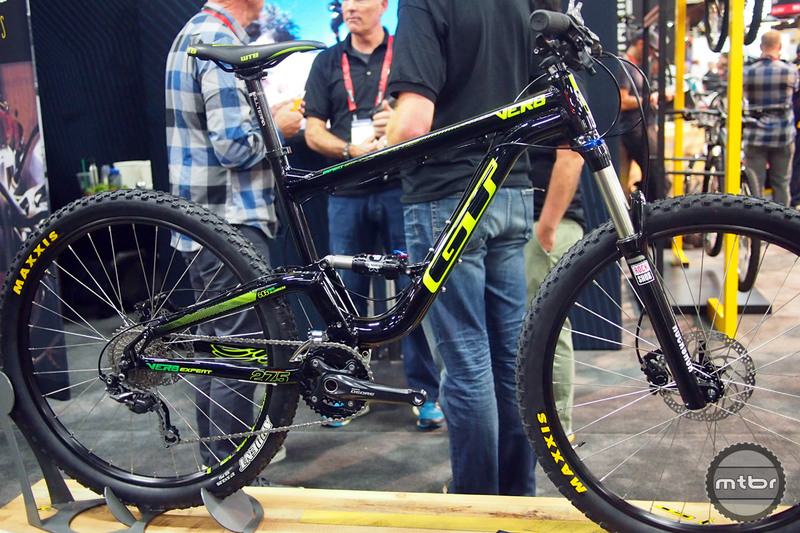 The GT Verb Expert was available for demo rides at Interbike for dealers to experience first hand its trail worthiness. Although not the most interesting bike to the harcore enthusiast, the Verb plays an important part in GT’s 2016 model lineup. 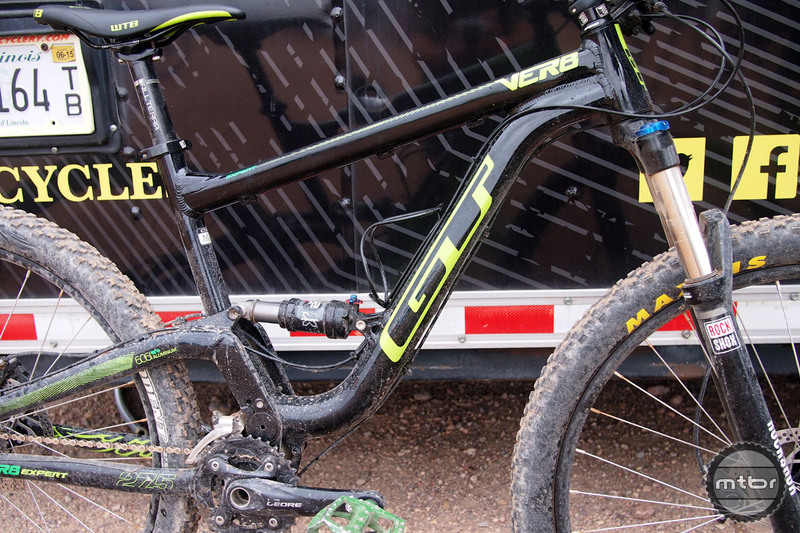 A bit dirty from demo rides, the Verb uses GT’s Independent Drivetrain system. How much does the GT Verb Expert weigh ? ?